Freight+Volume is excited to announce Holding Out For A Hero, an exhibition of paintings by Paul Gagner. 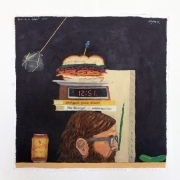 The artist’s signature amalgam of satire, whimsical expressionism, and starkly honest realism takes center stage, unfurling across canvases depicting fractured bodies and faces, recontextualized art historical signifiers, and oversized sandwiches, along with covers for books by Dr. Howard Moseley, a recurring fictional persona adopted by the artist. 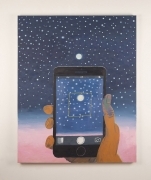 Modeled after the books of so-called “self-help gurus,” Gagner uses the painted covers as a vehicle to explore his own doubts and anxieties, particularly regarding creativity and the artistic ego. Shifting perspectives and aberrations in reality underpin much of the work, and allow the viewer to enter into the artist’s own cycles of self doubt and creation. Gagner’s portrayals of the human form are rather incongruous in Holding Out For A Hero, oscillating from hyper-specific observation to freewheeling, surreal variations of scale. In Hairscaping and Barbarian and his Barber, his fixation on and isolation of hair’s physicality recalls the work of artists confronting the abject (such as Kiki Smith and Mary Kelly); however, the sheer absurdity of the mountain landscape shaved into the back of the subject’s head in Hairscaping suggests a more whimsical, playful direction to Gagner’s interrogation of the physical. In Palm Reader, tiny female hands probe the palm of a massive, statuesque hand. The bandaged fingertips and blue thumb of the hand suggest injury and distress, magnified to an almost Christ-like manifestation of human suffering. 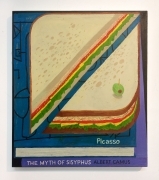 Several works on display depict oversized sandwiches juxtaposed with the spines of volumes by Picasso, Camus, and Baldessari, among others. Characteristically contradictory, these paintings at once appear to offer a nihilistic statement on the futility of culture, yet their execution suggests a different, less binary meaning. 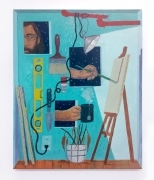 Gagner’s thick, corporeal brushwork and impasto technique transforms the bread and filling into rock-like slabs, and in Cheap Studio, he renders the raw materials of his creative process in a similarly concrete, radically painterly style, including even the leaking plumbing above his easel. Though they are thoroughly integrated into his practice, the Howard Moseley book covers appear as a distinct body of work. Their dimensions are much smaller than Gagner’s other canvases, and their tone is dark and bleak, bereft of the glimmers of exuberance that populate the other works on display. Coping With Death conflates career stagnation with actual death, and depicts an artist painting a self portrait as a crying clown. Secret Societies and Insult Your Opponents cast the art world as a place of paranoia, treachery, and inequality; the latter takes aim squarely at critics, with the refrain Your Paint Handling Activates My Conceptual Gag Reflex highlighting the harsh yet capricious language that can validate or delegitimize an artist’s commercial career. Paul Gagner is painter and sculptor living in Brooklyn, NY. He holds a B.F.A from the School of Visual Arts as well as an M.F.A. from the City University of New York at Brooklyn College. Paul’s work has been exhibited nationally and internationally, including Katharine Mulherin in Toronto, The Community in Paris, Hashimoto Contemporary in San Francisco, Halsey McKay gallery in East Hampton, Allen & Eldridge in New York City, and the Sheila & Richard Riggs Leidy Galleries at the Maryland Institute College of Art in Baltimore. He’s been featured in the art blog Hyperallergic and Art21 magazine. Most recently, he was featured on the cover and in an interview for the print magazine, Art Maze Magazine. Join us on for the opening reception with the artist, November 29th from 7- 9:30 pm. A full color limited edition artist book, available for sale on our website and at the gallery, will accompany the exhibition. For more information, contact nick@freightandvolume.com or eva@freightandvolume.com, or call 212.691.7700. Gallery hours: Wed-Sun, 11am - 6pm or by appt. Gallery hours: Wed-Sun, 11am - 6pm or by appt.